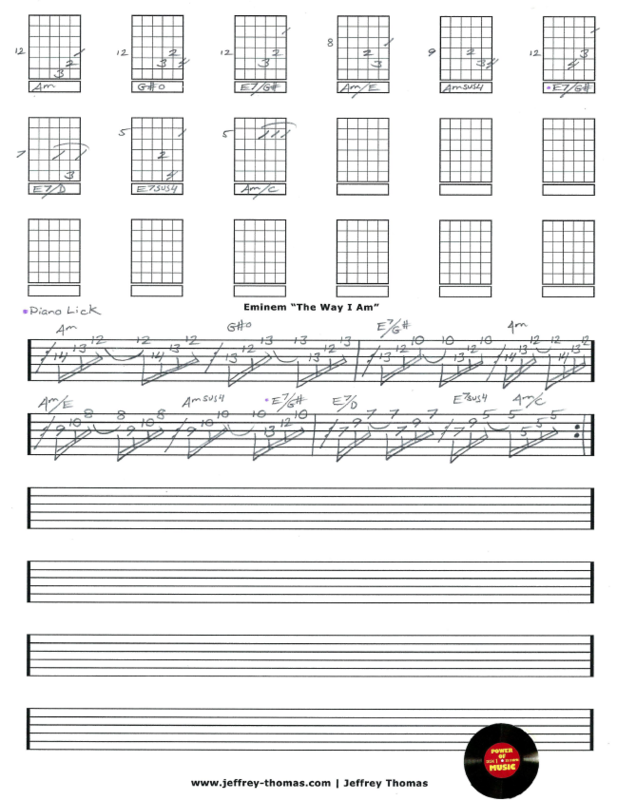 Eminem The Way I Am Free Guitar Tab by Jeffrey Thomas. I arranged the piano loop arpeggios on the guitar for this free guitar tab. They repeat through the whole song so there’s not much to it. The chords are really nice and it is basically back and forth from A minor to E7 with some suspensions. Many of my guitar students are into Eminem and request his songs. If you would like this full guitar tab for free just send in your email on the form provided. Looking to improve your guitar playing? Fill out the Schedule A Free Lesson form to set up your free Skype guitar lesson! “The Way I Am” is a touching song about how hard it is to be Eminem…lol. Check out more free online guitar tabs on my tab, blog and video pages.